Be seen. Be informed. Save money. Be supported while helping your community. The Muskoka Lakes Chamber of Commerce is ready to welcome you and start promoting your business through its network of Chamber members and beyond. We’re all about supporting local business and helping our communities thrive. Discover the benefits of membership. You’ll make great connections, earn valuable referrals and more by taking part in Chamber initiatives. We offer lots of networking opportunities with other Chamber members, business representatives and government officials. Make sure to save the date for our Business After Hours events. Your business will also be listed on our website with live links to your own business site and social media channels. And yes, we’re super social. We share your Twitter, Facebook and Instagram posts and your events through regular eblasts. Want your own eblast to hundreds of subscribers? We can arrange that, too, along with other advertising opportunities, such as our yearly Muskoka Lakes guide and directory (every member also gets a listing in our annual guide). You can also put your ad on our website. Plus, we partner with our local Regional Tourism Organization (RTO12) and Muskoka Tourism, among others, to promote you in digital content marketing campaigns. And there’s no better way to market than through word of mouth and direct referrals. People stop in our visitor information centres asking about everything from attractions to where to find a good roofer. We give you group benefits. Oracle RMS provides Personal Group Home and Auto Insurance programs for Canada’s largest employers, Professional Associations and Trade Groups in Canada. It offers member rates that cannot be found outside of a group program with extremely competitive rates for home, condo, tenant, automobile, watercraft, ATV, snowmobile, and trailer insurance offering member rates that cannot be found outside of a group program. Call us today to take advantage of our Chamber group’s buying power and get a quick, no obligation quote for all your home and auto insurance needs. Call 1.855.884.6150, Email savings@oraclerms.com or visit www.oraclerms.com. Use debit or credit card transactions with your business? You can save money on transaction fees and earn a $1,000 MasterCard gift card if First Data cannot beat your current payment processing fees. It takes very little effort to find out. To get started, all that’s needed is a copy of your present merchant statement. 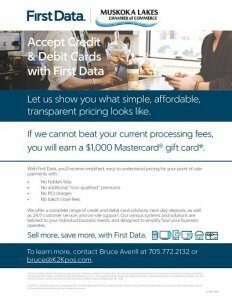 To learn more, contact our First Data Business Advisor, Bruce Averill at 705.772.2132 or bruce@k2kpos.com to be introduced to Bruce. Watch this video to discover what First Data has to offer Chamber members. Member FCA Insurance has special group rates for Chamber members for Commercial and General Liability Insurance. Can you provide a member to member discount? Talk to us as we grow savings for our members. For example, JMD Property and Tree Maintenance offers members a discount on tree pruning and other services. You can get a deal on Session beer at Clear Lake Brewing when you identify as a Chamber member. Did you know we have the certification stamp you need for exports in our office? Just call us to let us know when you want to come in for this service. Whether it’s new rules for dock building, or local construction that might have an impact on your business, or information about what’s hot in local entertainment, we keep you in the know. We also give you and your staff opportunities to sharpen your skills and knowledge through regular workshops and with free business consultations in Bala and Port Carling. We advocate for your interests. 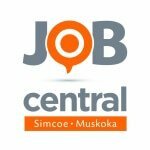 A membership with the Muskoka Lakes Chamber of Commerce includes membership in the Ontario Chamber of Commerce and the Canadian Chamber of Commerce, which advocate on a wide range of business interests. They stick up for the little guy – with campaigns such as Small business: Too big to ignore that your Chamber takes part in. 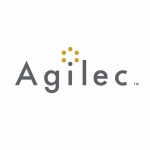 We share information from these organizations regularly on social media and in member e-blasts. We also have the municipality’s ear and support. We meet monthly with the members of the Township of Muskoka Lakes Council and staff to raise – and get action on – member concerns and advance mutual economic development interests. We have space for leaderboard ads and box banner ads on our website, which is often a first stop for people interested in finding a business in Muskoka Lakes. Call us today about these opportunities. Affordable and effective, the Muskoka Lakes directory and guide gets into the hands of 10,000 visitors and Chamber members to cross promote Chamber businesses serving Muskoka Lakes. Every Chamber member is listed in this directory, which some members say is worth the price of membership on its own. 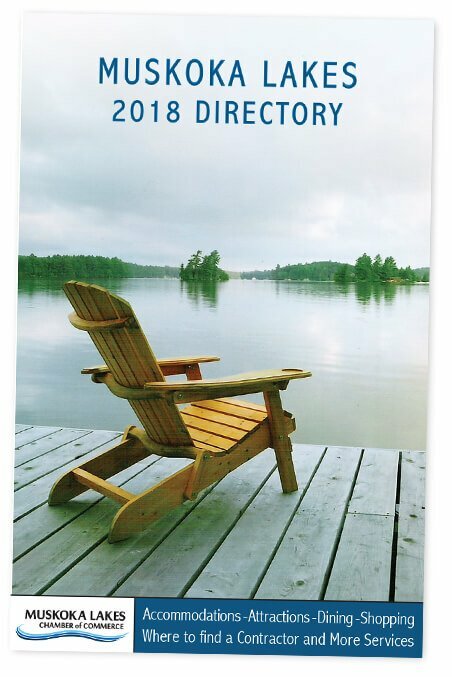 View the 2018 Muskoka Lakes Directory (17MB PDF). Your Chamber works hard to get matching funding for digital campaigns to support events, such as the Muskoka Lakes Maple Trail, and Shop Local campaigns. Pitch in to put a spotlight on your business. Have an event coming up? Looking to hire? Work our network by sending out an eblast with the information you need to share. Just $100 + HST. Please send jpg picture files and copy content to help us get your eblast out easily and most effectively. There’s space at the busy Bala docks for your ad on our Chamber board. 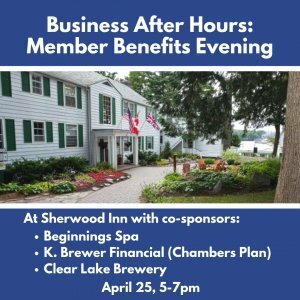 THURSDAY, April 25 BENEFITS AND SOLUTIONS Business After Hours, 5-7pm, at Sherwood Inn and Beginnings Spa. Learn about Chamber affinity programs, meet funders and network with fellow Chamber members. What is Business After Hours? The Business After Hours (BAH) is our premier monthly networking event. It gives you the chance to meet, exchange ideas, and build long-lasting relationships with other Chamber members in an easy-going setting. It gives the sponsor business an opportunity to showcase their workplace, services and to gain valuable exposure. Chamber members often gain business referrals by attending. Chamber members and their guests are invited to come out, share some nibbles and drinks, and get to know each other better. To sponsor a Business After Hours, you must be a Chamber member in good standing. Ask us how you can host a Business After Hours. Our most recent Business After Hours was December 4, 2018 at The Hudson Hair Salon and Spa in Port Carling. Beyond your Chamber, there are many local business resources we partner with to ensure you get the answers or support you need. Your Chamber operates or supports fun annual public events that aim to bring more visitors to our region all year round. Showcase your business at this popular craft and gift fair, one of the first holiday shows in the region. The 8th Annual Muskoka Lakes Christmas Market is a one day show on Saturday, November 3, 2018. Join in the fun and bring joy to hundreds of people at our annual Bala Santa Claus Parade. This year we are celebrating Bala’s 150th birthday – be sure to be seen in the parade! BIG NEWS: The Muskoka Lakes Chamber of Commerce, together with the Gravenhurst Chamber of Commerce, is bringing the 2019 Ontario Chamber of Commerce Annual General Meeting and Convention to Muskoka. We are the smallest Chambers to ever earn this honour and we’re looking for sponsors who want valuable cross Ontario promotion of their businesses. Please consider seizing this unique opportunity. DOWNLOAD SPONSORSHIP INFORMATION by clicking here: OCC Sponsorship Package 2019 – MLCC. Know more: Call Norah at 705 762 5663 to learn more about becoming one of our sponsors at this prestigious event.